I picked up a 150 gal a while back, wasn't in the condition I was hoping for but good enough for the kids python so I traded his (I think) 45 for it. She is much happier. Went and picked up the 45 from the boy today and it is a reptile tank and it has a tag that states 'do not fill with water' - similar to 'do not drill' on tempered stuff. Why? it is 3/16 glass and even not tempered should be strong enough? I can reseal if needed but not sure why I can't put water in it? Anywho - thoughts on the reptile 45? Listen to the manufacturer who designed it.. Chances are either the glass is too thin and or not well braced..
"do not drill on tempered glass" because the tempering process puts in under compression and tension .. If the surface layer is broken the glass basically implodes/explodes into small pieces.. 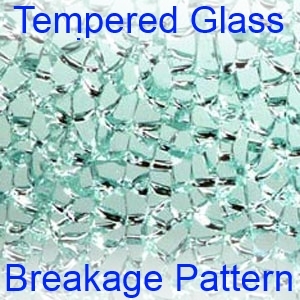 When tempered glass breaks, the energy retained in the glass due to internal tension/compression releases explosively and produces a glass breakage pattern sometimes called “cubes”. Yeah was in the glass biz for a decade so know about the differences. That said I filled up in the driveway and noticeable bow in the front so it appears to be a frame strength issue. You could euro brace it..